A brand new tool has been created to encourage students to keep ahead in reading, writing, and math, both during school and summer breaks. Nasco’s Smart Start Kits reviews what the student learned the previous year and takes them into what they will be learning the next year. 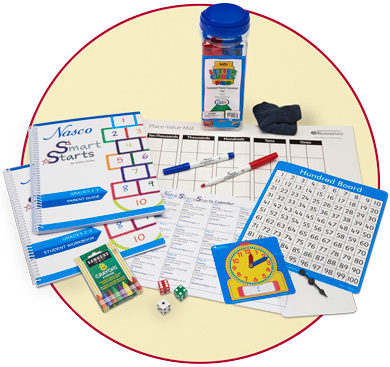 Created for grades kindergarten through fourth grade, these kits have everything you need to keep students on their toes between classes and grade levels. The Smart Start Kits were created by Kristin Hotter, a teacher who has been working on a variety of curriculum-based projects that have allowed her to stay in tune with the changes and challenges today’s students and teachers are facing. The nonfiction texts are purposely chosen to give students access to science and social studies texts and activities. Each kit also gives students a chance to work on writing skills. These kits aim to give students engaging writing topics that help them practice and hone their craft by writing about topics of interest. Many parents do not have the confidence or resources to feel they can positively help their children with their academics. The Smart Starts kits attempt to bridge that gap. They include a detailed parent guide that is scripted, so parents know exactly the questions to ask and the activities to work on with their children. Check out our website and see if our Smart Start Kit work for you! If you have further questions feel free to call our Customer Service Center at 1-800-558-9595. Next Post Is Forensic Science for You?